…a fresh eye on the mysteries is what’s required. Deer Diaries: the Seasons at Cat Crossing Farm chronicles the lives of does and fawns, bucks and birds, turtles and snails, and red-eyed bugs throughout the year. From ice and snow to budding spring to hot, stormy summer days and the blazing colors of fall, Stanton’s luminous poems invite readers to see the wild life in our backyards with new eyes. If you’ve ever lain awake at midnight, in the morning, and heard deer chomping your shrubbery… if you ever got so lucky as to see a new-born fawn curled up in grass, a ten-point buck clearing the pasture’s gate, an albino doe flashing before you… if you ever stopped in wonder to count the herd at dawn or dusk… you will love Deer Diaries. And not just for the deer, but for a host of other acutely observed rural creatures—birds, a snail, a turtle, and a vibrant brood of cicadas emerging in their thirteen-year cycle. I’m only here to marvel? to clean up my mess now. only to find them gone. 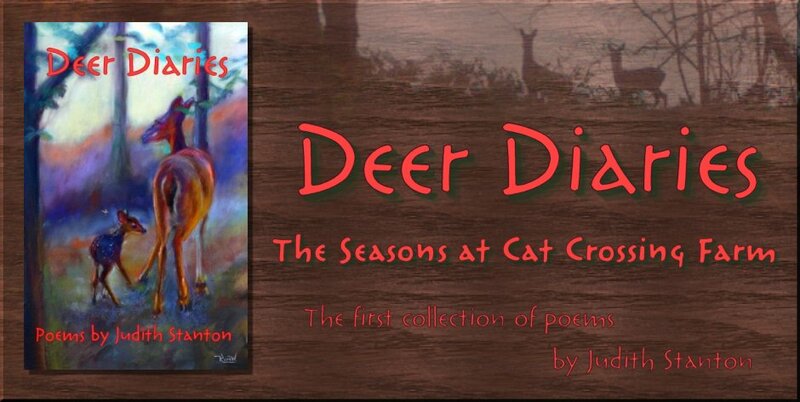 At the first reading of the Deer Dairies, it becomes readily apparent that Judith is a true lover of the outdoor world. She treats Mother Nature’s triumphs and tragedies with equal clarity and compassion. Perhaps this is most obvious in her description of the three-legged doe in the opening poem. 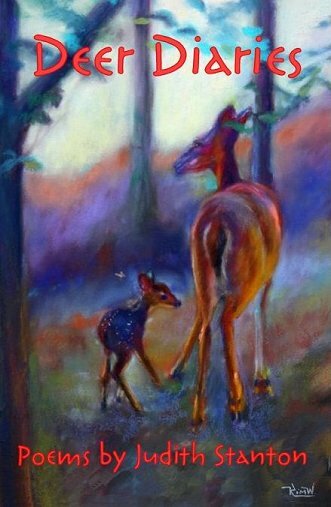 What a dire predicament for a deer, yet what a marvelous story how she has survived and now has a new-born fawn. To me, much “modern” poetry is not poetry, but rather choppy prose, devoid of pace and rhythm. Not so these! Read them aloud, and revel in the marvelous cadence.